Bitope in my study. 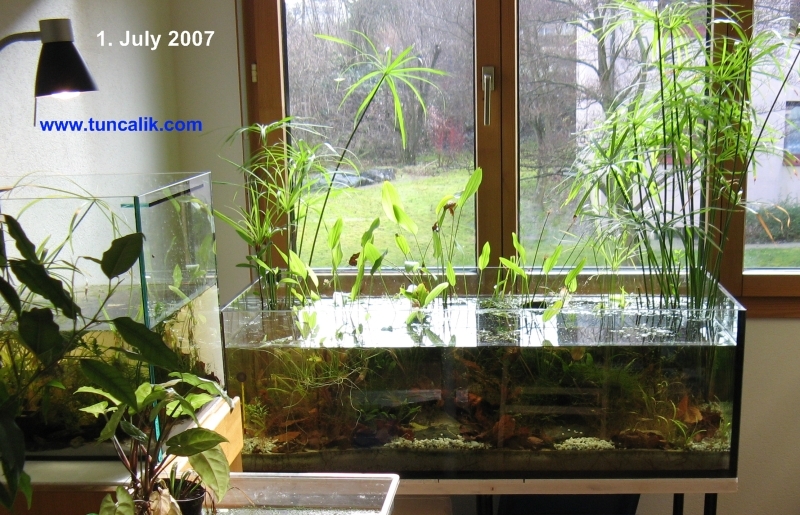 A low-tech natural aquarium. Click on to view the bigger picture. Like natural garden ponds this aquarium has no filter, no heater, no artificial light, no electrical equipment at all. It is a silent aquarium, a piece of real tranquility. It receives natural sunlight directly from the window. The temperature may drop to 16°C in winter, and rise up to 28°C in summer, but no problem; the inhabitants are suitably selected subtropical species. The marginal plants, especially the umbrella plants (Cyperus alternifolius) keep the water much cleaner than any manmade filter can. Because the nitrate and phosphate levels are so low that they are practically immeasurable, even direct sun light for a couple of hours doesn’t cause algal blooms. Size of the tank: 120x60x40cm, 40 cm is the height. Inspired by natural garden ponds I gave no fish food at all in the first eight months because I wanted to have a self-sufficient ecosystem with its own food chain. The fish I added after four months like dwarf croaking gouramis (Trichopsis pumila) and scarlet badis (Dario dario) could flourish by eating young dwarf shrimps, crustaceans and other micro-animals they could find in the aquarium. All these micro-animals could in turn grow and multiply well by eating algae and plant remains. My only input to this ecosystem were dried beech leaves from the nearby wood. Half pyramid structure with foam sheets. 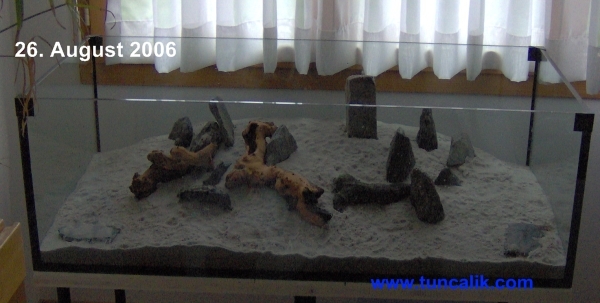 I began to set up the aquarium in August of 2006 as illustrated in the pictures below. By gluing progressively smaller foam sheets from bottom to top with aquarium silicon I constructed a sort of half pyramid. My objective was having different depths in the tank with a shallow water zone at the back. I waited four months before adding four scarlet fish (Dario dario), a pair of dwarf croaking gouramis (Trichopsis pumila) and six celestial pearl danio (Celestichthys margaritatus) into the tank. After four months I thought the population of shrimps and arthropods reached a sufficient level for sustaining the carnivorous fish. I had planted the umbrella plants on the right and left backside corners. They thrived unbelievably fast. I guess, they like natural sunlight. Already after two weeks their reddish roots were all over the tank like hair bundles, also reached the front glass. The umbrella plants are perfect for the purification of water and sand, but they cause a mess in the aquarium and threaten other plants. Mixed up with Java moss the roots of umbrella plants make impenetrable jungles up to the water surface. This jungle like ecological niche might be ideal propagation ground for small invertebrates provided that it receives sufficient oxygen. But I know today that umbrella plants must be kept several meters away from other plants because they are so dominant and fast growing species. The sword plants (Echinodorus species) with emergent leaves were growing well at the beginning but they slowed down after several months. They are still alive today (July 2007) but almost without growing. I guess, the reason is either iron deficiency, or the harsh competition of umbrella plants. Java moss is a real nuisance in this aquarium. They propagate so fast that they cover all the other plants in a few weeks. I have to throw away bundles of Java moss regularly. Though it makes ideal hiding and feeding ground for invertebrates and baby fish Java moss is not sustainable in the long term. It requires so much maintenance, that’s not the idea. I should either get rid of Java moss or find a small herbivorous animal which can eat it. The sword plants and Cryptocoryne wendtii can grow together. 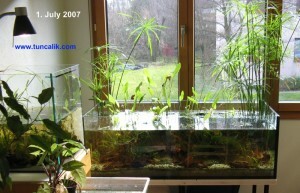 The same can be said for the triple Hygrophila polysperma, Anubias nana and Java fern. I think, these are all sustainable, low maintenance plants in most cases. Hygrophila corumbosa didn’t grow well from the beginning. It either didn’t like the conditions of my tank, or couldn’t stand to the competition of other plants. As to the swimming plants: They all multiplied fast initially, then came to a standstill, and finally disappeared altogether after eight months, including the invasive common duckweed (Lemna minor). I observed a similar phenomenon in the temporal lakes in Bolivia. The swimming plants which invade the whole surface initially begin to diminish due to the competition of plants like water lilies that have roots at the bottom. Such plants like water lilies don’t depend on the nutrition content of water alone because they can take additional nutrition from the bottom substrate (iron-rich laterit soil in most cases) through their roots. I guess, plants like umbrellas are purifying the water so well in my tank that even invasive plants like duckweeds must starve. To summarize what I learned through all these observations, mixing up plants after the visual aesthetic, or visual imagination without the support of experience never give satisfactory results. Each species, or each compatible group of species must have sufficient area in the tank. Otherwise, the dominant group will invade the whole aquarium unless you fight against it with a high level of maintenance. For example, I would have only umbrella plants and Java moss in an aquarium, provided that I am ready to throw away the excess Java moss regularly. Or only sword plants (Echinodorus species) and Cryptocoryne wendtii in another. Water lilies can be kept in large aquariums, or better ponds with sufficient distance from other plants. I never saw the water louse (Asellus aquaticus) again after I added them to the tank. I had hoped that they would thrive among the beech leaves which I collected from the nearby wood because they are perfect herbivores for any ecosystem. Their larvae could be excellent addition to the food chain for the fish. I still don’t know today (July 2007) if any of them could survive. But I guess, they need a hibernation period in really cold water in winter which is not possible in a home aquarium. The dwarf shrimps (Neocaridina denticulate) thrived extremely well and reached an unbelievable population in just four months. I guess, they liked the clean nitrate-free water. After four months I could see baby shrimps everywhere in the tank. Because there were no enemies like carnivorous fish they were foraging freely during the day. They changed their behavior after I added the carnivorous fish like the scarlet badis or dwarf croaking gouramis. They began to live nocturnal and hide during the day, especially the small babies. Though some of them fall prey to fish their population was big enough and stable after four months with the carnivorous fish. The Mexican amphipods (Hyalella azteca) are I think ideal animals for any biotope aquarium. They are the North American version of the better known fresh water shrimp Gammarus pulex. They are but smaller, and more resistant to higher temperatures, oxygen deficiency and organic pollution in water. Hyalella azteca can grow up to 1 cm, though it generally remains smaller. It’s generally said that they require hard water (GH over 10) for breeding. Initially I thought baby Hyalella azteca would be ideal food for the fish. And because the scarlet badis or dwarf croaking gouramy are not large enough to eat adults a sustainable population would be feasible for the long term. But I had suspicions about their breeding potential because the water was maybe not hard enough (GH = 8). But the Mexican amphipods could multiply quite well even though not as prolific as the dwarf shrimps. They also switched over to night life like shrimps after I added the carnivorous fish. But I guess, they are not as good as shrimps in escaping predators, especially the baby arthropods. Nevertheless, I can still see today Mexican amphipods at night among the plants when I look with a torch. I guess, most of them are hiding among the stones and gravel. The Malaysian trumpet snails (Melanoides tuberculata) are voluntary recycling workers. They keep the sand clean just like the earthworms do for soil. They generally hide in the sand during the day and come out at night. They are hermaphrodites carrying both sexual organs on a single body. They can fertilize themselves (I don’t know if they can do cross fertilizing) and generally they are prolific breeders. I had started with ten trumpet snails a year ago. Now I can see lots of them. Trumpet or ramshorn, snails are indispensable agents for recycling in an ecosystem. They break down the organic matter before bacteria do and make them easily available for plants. This is exactly the type of recycling we need with a low bacteria level. Water fleas (Daphnia pulex) could also multiply very well in the first four months with the algeater dwarf Otocinclus as the only resident fish. They disappeared in a few days after the arrival of scarlet badis. I was sorry for my water fleas and for the diminishing biodiversity but I knew that the water fleas had no chance. But I know today that the common water flea can easily be a part of such an ecosystem with shrimps and plant eaters without the carnivorous fish. 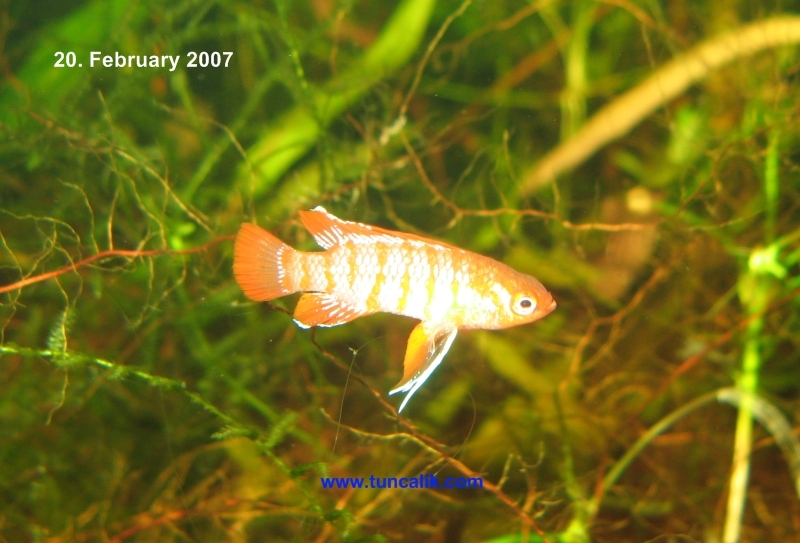 About three months after the initial set up I thought, the population of shrimps reached a sufficient level for sustaining tiny carnivorous fish, and added four young male scarlet badis to the tank (November 2006). Only males, because I couldn’t find any females. It’s somehow very difficult to find female scarlet fish. I added a pair of dwarf croaking gouramis in December. 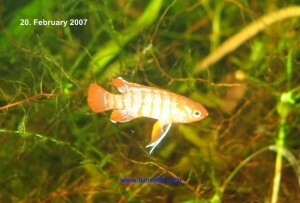 Scarlet badis (Dario Dario) is a magnificent tiny fish of Indian origin whose size can hardly exceed 2.5 cm. Because it lives in ponds and lakes in high altitude plateaus it likes cool water, but it tolerates temporary higher temperatures like 28°C. Dario dario is in general a hardy fish. It is resistant to diseases and adaptable to various water conditions. But they rarely accept staple food; they need live foods. That’s why they are not easy fish to keep in any home aquarium, but ideal candidates with their tiny size for a self-sufficient biotope aquarium. They are very beautiful. They resemble the anemone fish of coral reefs with their bright colors. My four young scarlet fish thrived in the biotope without any additional food. In several months they became colorful and aggressive adults. Each had its own territory in the tank. They were slimmer, more colorful, more aggressive and agile than the scarlet fish I have seen in some industrial aquariums. Even their behaviors were different. They weren’t showing up the whole day like a porcelain piece in a vitrine. They were hiding most of the day only to appear at dawn and dusk times. They were briefly but efficiently searching for food and showing other males who is the boss in their territory. After five months my scarlet badis were still as healthy as iron, and I was sure that they could find sufficient food in the tank. This was the aquarium now which I enjoyed most because I could observe more natural behaviors. How should I find wives for my scarlets on heat? It was a mistake to put dwarf croaking gouramis to the tank. I had initially hoped that they would remain near to the surface and leave bottom areas to scarlets. But they didn’t. Maybe due to lack of swimming plants on the surface they looked for hiding places on the bottom and dominated scarlet fish. Though they looked healthy enough I think my unheated aquarium was too cool for the gouramis. So, after three months I separated them to another natural but heated aquarium. They are still living there together with Betta imbellis. They could even produce some young fish in the meantime. Celestial pearl danios (Celestichthys margaritatus) are small swarm fish with Asian origin. 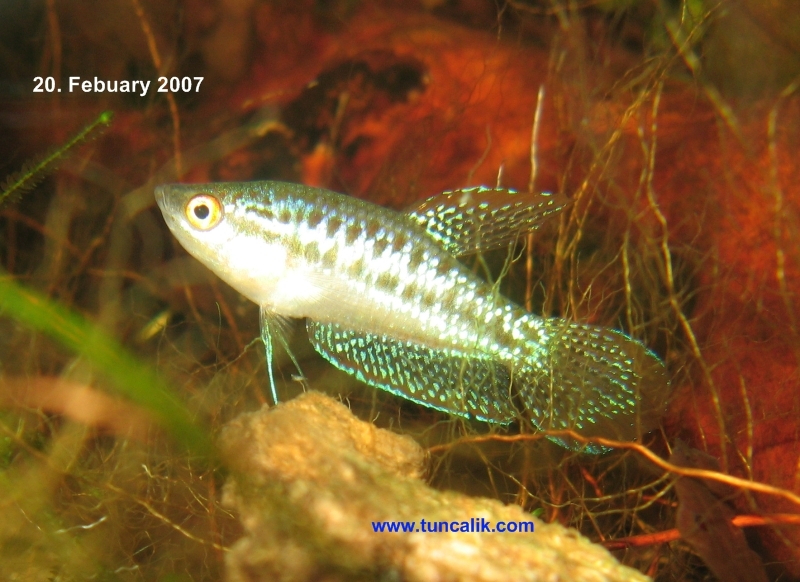 They are close relatives of the well-known zebra danio (Danio rerio). I preferred pearl danios to zebra danios because they are smaller, calmer and they don’t have the habit of jumping off the aquarium. Like scarlets they can perfectly be kept in unheated aquariums with temperatures varying between 15° and 25°C. 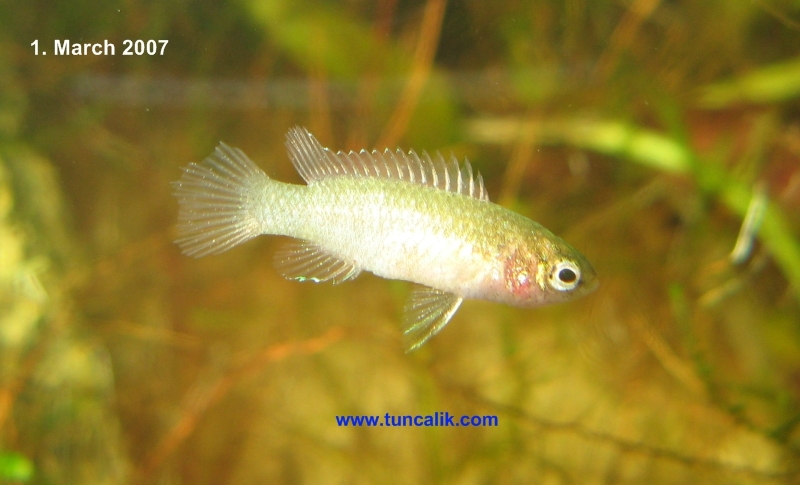 Pearl danios proved quite compatible with scarlet badis because they are peaceful and surface dwelling swarm fish. They look healthy and satisfied but I am not sure if they will get enough food in the long term. Maybe they are too large a burden for the food chain of a small biotope without insects raining from the sky. All went very well until I found female scarlets from a private breeder in Germany. My male scarlets were very happy for a couple of days. But only a couple of days because all the fish except pearl danios died, I guess, due to a disease carried by female scarlets. A tragic end to my experience with scarlets. 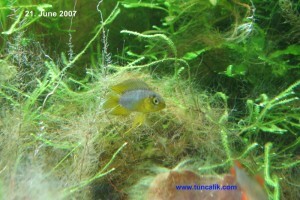 Since then, I am keeping dwarf yellow cichlids (Apistogramma borellii), another subtropical species. Unfortunately, I had to give up my self-sufficiency concept with borellis because they are not tiny enough like scarlet badis. I had to begin giving some supplementary food even in miniscule amounts. Nevertheless, I am now quite sure that the self-sufficiency concept was a success with the tiny scarlet fish. I will write my conclusions as comments. Your comments are also welcome. Don’t forget to watch related videos below. This entry was posted on Sunday, September 27th, 2009 and is filed under Natural aquariums. You can follow any responses to this entry through RSS 2.0. You can skip to the end and leave a response. Pinging is currently not allowed. Excellent idea this setting up low maintenance aquariums. Easier to keep and looks more natural. I am also fed up with dealing cleaning repairing technical equipment. Much inspired by your biotope I am thinking about setting up a similar aquarium with Apistogramma. I don’t know only which Apistogramma. Any idea is very much appreciated. 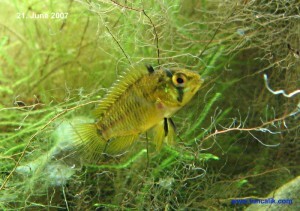 Has anyone tried such an aquarium with an Apistogramma species? Generally, I would recommend small and slow growing Apistogramma species like borellii and trifasciata. They are more adapted to sparse food conditions. I would like to try a low tech tank myself. Many thanks for all the info. I think I will go with some white cloud mountin minnows as my fish as well as the dwarf sucking catfish and lots of inverts. Nice tank!…eco-style and all! But i guess that you have a lot off natural sunshine in Turkey? I live in Denmark and its cold and no much sunlight in the winter. So a some lightning is the needed….. Yes, of course there’s more sunshine in Turkey compared to Denmark, but the natural aquarium mentioned in my article is in Switzerland. The short winter days may really be a problem for plants in Denmark, so I guess you might need supplementary artificial lighting, or you might try highly adaptable subtropical plants. With foam sheets I tried to create different water depths in the aquarium, that is, deeper and shallower zones. I had hoped to create different ecological niches for plants and animals. Today, I don’t think it really works in such small aquariums. For a larger pond I think it would certainly be useful. Hi, I’m fascinated with your natural aquarium because I have not been able to find documentation of anything close anywhere on the internet. I have an existing small (29-gallon) tank that I want to convert to a similar concept. Its bacterial ecosystem is intact but although once heavily-planted, it has no plants at this time. I want a natural, low-tech, self-sustaining aquarium (the exception being light, it won’t be by a window) and I’m told by everyone it can’t be done. I say that’s ludicrous, and thanks for proving me right. Two questions: you didn’t mention water changes, did/do you do any for this tank? And do you think this concept is possible with only submerged plants, or are the partially submerged, faster-growing plants necessary for filtration? My water changes are really rare; maybe 3-4 times a year, at most %10. Dwarf shrimps may need rain effect for breeding. For that purpose, I let the water level drop up to 10cm (4 inches) through evaporation, then fill in rain (RO) water. A self-sufficient aquarium without sunlight and marginal plants? I think, it depends on the type of animals you want to keep. In any case, it must be a low-density aquarium, otherwise the purification capacity of submerged plants will not suffice. As you know, even in a typical high-density home aquarium with filters heaters etc., if you fully omit water changes the level of pollution (nitrate, phosphate etc) will not increase indefinitely; it will stabilize after a while at some high pollution levels. The question is, whether this level is healthy for your animals. In my experience, it’s possible to maintain much lower pollution levels with marginal plants without water changes. But some fish or an invertebrate may still need water changes for stimulation into breeding. The lack of sunlight is another difficulty. Some algae and other microorganism that feed on these algae can only multiply under natural sunlight. Without sunlight there might be some minor gaps in your food chain and in the required biodiversity for an efficient recycling. Nevertheless, I think it should be possible provided that you loosen the concept of total self-sufficiency a little. There must always be some inputs and outputs even in low degrees. 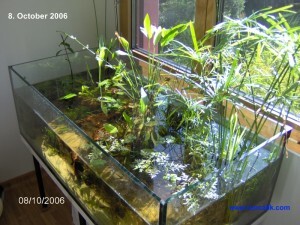 I have for example a 50 liter low-tech aquarium with artificial lighting (daylight lamp) with waternymph (Najas guadalupensis) and duckweed (Lemna minor). In this aquarium I have snails (ramshorn and trumpet), 1cm (0.5 inch) layer of sand, algeater catfish Ancistrus dolichopterus, dwarf shrimps (Neocaridina sp. ), and Mexican amphipods Hyalella azteca. Inputs: Dried leaves, zucchini, cucumber and carrot skins (small amounts). Outputs: Occasional water changes (f.e. 3 liters every two weeks) with some plants, snails and Hyalella azteca taken out for other aquariums as food. In this form, this is a sustainable aquarium working since three years. Such a simple ecosystem in a larger scale would I guess sustain several small fish like the scarlet badis (Dario dario) without any problem. Thats technically not a biotope. Im seeing fish from 2 different continents. A biotope has fish, invertabrates and plant life from one specific area. Cool aquarium though. First selfsustaining aquariumive seen, very good idea. But the waste has to go some where? FF95, the idea is that the fish waste should break down to plant food. Instead of the bacterial filtration being primary (NH4->NO2->NO3) the plants use a more efficient system to process the waste. The invertebrates make the mulm easier for the plants to process, and in turn the plants feed and oxygenate the animal life. Right Tuncali? Yes, both of you are right. I am using the term biotope rather loosely just like other hobbyists, but in a different sense. The official definition of biotope: “An area that is uniform in environmental conditions and in its distribution of animal and plant life”. But I understand what you mean. 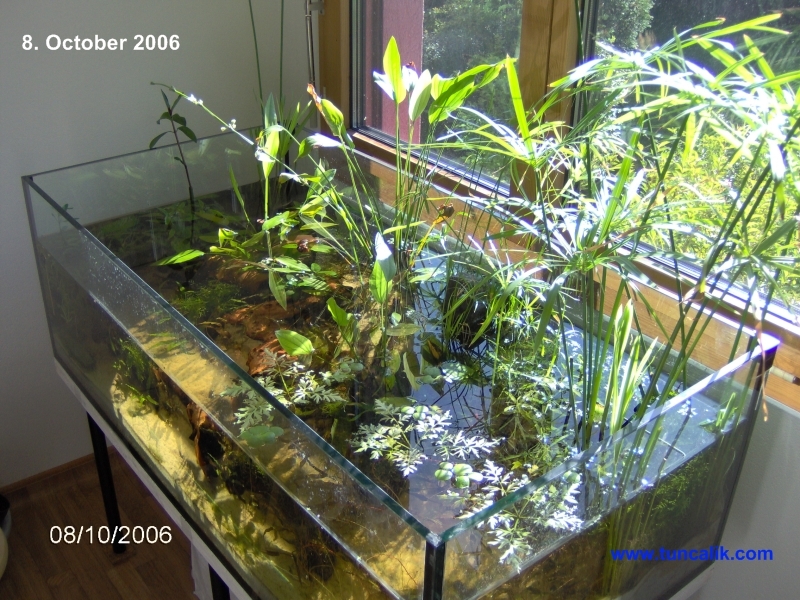 The most established use of the term biotope among hobbyists is choosing fish species from a certain habitat, e.g. a lake or pond, otherwise leaving everything like food and recycling artificial. For me, the most important aspects of a biotope are biodiversity, recycling and sustainability with its own food chain. Invertebrates like shrimps, arthropods, snails and sand worms decompose waste material into plant fertilizer much faster and efficiently than the bacteria. And as D. Walstad explains, bacteria convert ammonia into nitrates which is less readily taken by plants as food than ammonia. That is, too much bacterial life is unhealthy for fish and plants. Waste goes ultimately into the biomass of growing marginal plants. Some snails can also be taken out if they get overpopulated. The biggest challenge is probably keeping the sand healthy in the long term without the accumulation of waste. For that purpose, I use trumpet snails and marginal plants like the umbrella with strong roots. My input to this ecosystem is occasional dried leaves, potato and carrot skins for herbivores. I would appreciate very much if you write about your own experiments on low-tech aquariums, either as comments here or in forum. In that way, we could share our experience about different ecosystem models. Hello, Tuncali! I love your self-sustaining tank experiment! And thanks for sharing all that information. I’m a newbie to the hobby, and it’s too bad I only learned about natural aquaria after I already set-up my 20-gallon planted tank the high-tech way. Anyway, I do plan to upgrade to a larger tank a few months from now–and that one will be as natural as I can make it. When I do set it up, I’ll share my notes with you. Meanwhile, I hope you can keep posting updates on your biotope. The more I can learn before setting up my big tank, the better. this is a lovely natural set-up! It’s really nice to read about your experiences, no need for us all to make the same mistakes! Sorry to hear about your D. Dario’s. I have some myself and they are wonderfull fish. I’m hoping, fingers crossed, I have some females now too, would be really nice if they bred for me. My question for you is about your ground cover, What does it consist of, just sand? Or did you add some layer of fertilizer? I know Diane Walstad does so, but honestly: I’m scared! Afraid of terrible algae bloom. Would be really nice if you could tell me your experiences. Hello Karen. I used a thin layer of red laterite soil as the bottommost layer (totally about 2 kg) and simple quartz sand over this laterite. As far as I can remember D. Walstad advices using clay, or simply soil as substrate provided that it doesn’t contain any organic substances or humus that might decay quite rapidly and cause algal blooms due to high levels of phosphates or nitrates. Clay without humus is a perfect substrate if you want to grow larger Echinodorus species. I wish you good luck with your darios. Really splendid fish for natural aquariums. I love your tank. I have something similar but in a smaller scale. I caculate your tank size, it is really 76 us gal? Also where can I go about to buy one of these tanks?. Thanks in advance. Yes, approximately. 1 US gallon is about 3.785 liters. Considering that I never fill the aquarium full to the top (160x60x40cm, 40 cm the height) it contains about 300 liters, and about 80 US gallons of water. 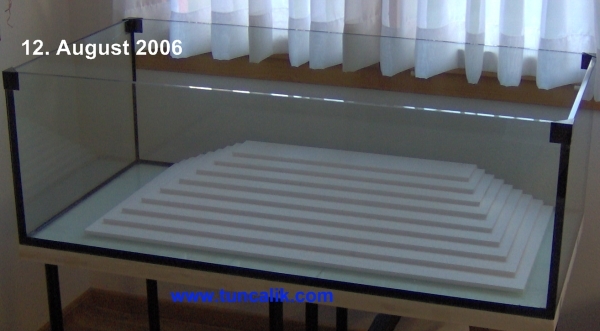 I had ordered my aquarium to a well-known glass aquarium manifacturer in Switzerland. 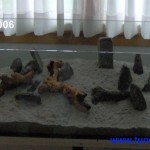 There are such manifacturers who can make custom-size aquariums; quality and security are quite important. The glass should be thick enough to bear the water pressure. If your aquarium will receive sun light I would recommend you to go for a large size and deeper aquarium for a stable pH. Water depth is like a pH buffer. Or you will need to shade your aquarium to prevent large pH fluctuations. Have you considered adding a culture of live aquatic worms, such as tubifex, or blackworms, to your substrate? They are useful for breaking down waste, and aerating the sand, and it seems they may have a denitrifying effect. 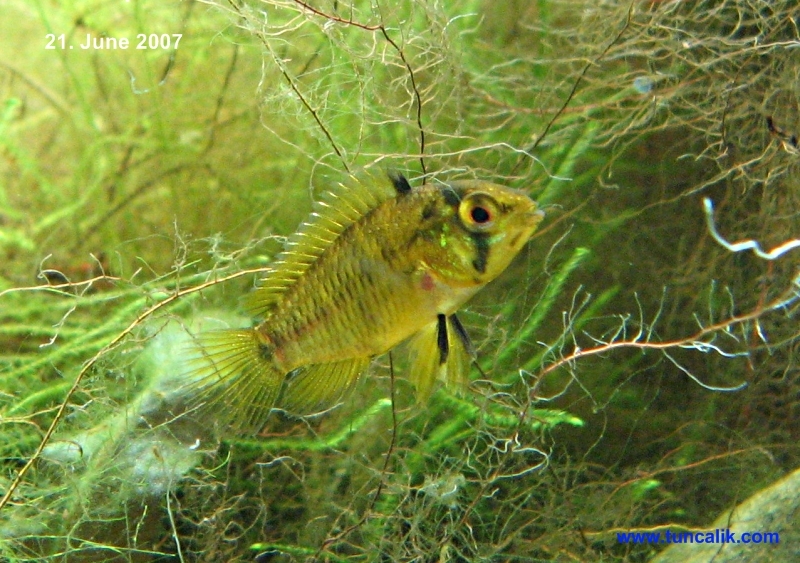 Difficult-to-feed animals, such as peacock gudgeons, and african dwarf frogs, become nearly effortless to feed this way, even in a community setting with faster, more competitive eaters, such as rainbowfish. The worms themselves eat leaf litter, and detritus. I have been maintaining my own blackworm culture for a while, but I am switching over to tubifex worms, because they are apparently more suited to indoor aquarium conditions, and I believe they will breed faster. I have never had good luck with corydoras, but since I began keeping live worms in the sand, my habrosus dwarf cories have been absolutely thriving. Interesting that you ask it, because I put tubifex worms into my aquarium two months ago after reading “Culturing Live Foods” from M. R. Hellweg (see amazon.com). I haven’t yet checked the worms to see whether they are thriving or not. I also think that they should be efficient recycling agents living in the sand. I wonder, if they can sustain their population in an aquarium with worm predators like dward croaking gouramies. Lovely! One of our new members (@ NaturalAquariums.com) posted a link to this page. There are several of us there who do these types of low tech to no tech tanks. Come visit & share your experiences w/ us there if you get a free minute! I recently bought my tank, I was planning on having a planted tank. I couldn’t find many plants but I sure have the plant you have in the middle of your tank which has some flowers. Also are those lucky bamboo? or some other type? I used a little soil and gravel for plants. Sadly in Sri lanka I can’t find any aqua soil.